Providing you the best range of folded omr sheet, omr sheet with answer booklet, carbon less in triplicate omr sheets, omr sheet with admit card, omr sheet with variable data printing and carbon less duplex omr sheet with effective & timely delivery. Size 8.25" X 11.25" or 8.25" X 14"
Folded Omr Sheet are used where Matter of Omr Sheet is too large and can not be accommodated, in Folded OMR Sheet, therefore matter is accommodated in Folded as per international Standard Information may be used that of Registration, Number of Answer with multiple choice option to suits the requirement. Omr Sheet with answer are of size 8.25" X 14" A-4, 105 / 120 gsm and stapled with A-4 size answer booklet, Bar code / QR code / Litho code positioned at three locations and three number perforations are given on Omr Sheet. 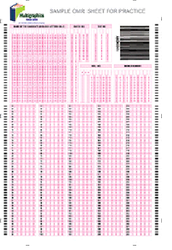 This Omr Sheet is used to keep the candidate's I.D. confidential from examiner examining the answer sheets. 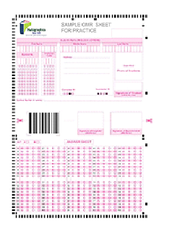 Size of Duplicate Omr Sheet 8.25" X 11.25"
Carbonless Omr Sheet is in Triplicate is used for sensitive exams, where transparency matters, one copy is retained by the examiner for evaluation purpose and other one by the student and 3rd for record. When key is announced, the student can verify his correct and wrong answers and he can evaluate his numbers also. 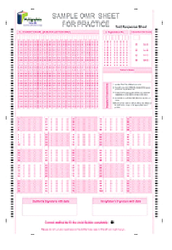 Such type of Omr Sheets are generally used for exams purpose only. Omr Sheet with admit card is so designed that the admit card with photo and signature is added on the bottom side of Omr Sheet, after the verification of the documents, same card is used for admit card after scanning and tearing from the perforation and can be uploaded on website or sent though post or courier. 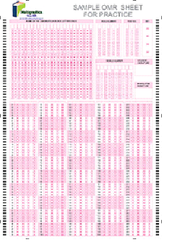 Omr Sheet with answer are of size 8.25" X 14" A-4, 105 / 120 gsm. Security Feature Bar code / QR code / Litho Code may be used as per requirement. These Omr Sheets are also known as Registration Omr Sheet or Admission Omr Sheet. In OMR Sheet with Variable Data Printing, the candidates all personal information is pre printed so, during the exam candidate get the personalized Omr Sheet. Such Omr Sheets may be taken single, in duplicate, in triplicate or folded. Security Feature Bar code / QR code / Litho Code may be used as per requirement. Information may be used that of Registration, Number of Answer with multiple choice option to suits the requirement.